This particular photo was taken on October 5th at 5:32 PM outside of the UMC’s far-side entrance. The image was edited to have its negative be displayed to show the color contrast as the sun was setting. In Photoshop, the white borders of the mountains and buildings were cleaned to not show windows or outlying rock formations. These cumulus clouds were most likely on the verge of dissolving as they had originally started out as cumulonimbus until a large chunk separated and migrated West until it began to dissipate. The umbrella instability blooms in this inverted image, as a dye stream emerges from a layer of oil into water. Interesting negative photo. It adds a neat artistic value, but can you still visualize the same cloud phenomenon? I like how you inverted the colors! It seems to mess with the viewer’s perception some. That red dot is making me think of aliens, which if I remember correctly was the intent of the negative colors. I think the fact that there is a lot going on in the picture really adds to this effect. This is an interesting approach; I like the outside of the box thinking. I really like the artistic approach that you took with this photo. I would suggest trying to remove some of the distracting elements in the photo. Overall great work! Very interesting image! It was creative of you to take the negative of the image, it gives an effect that none of the other cloud pictures in this gallery give. The gold sky and black sun are the first things that caught my eye. There’s something about it that looks like calm water in the ocean in the evening. The red dot is a little distracting but could be easily removed with Photoshop’s Clone Stamp tool, if you wanted. Interesting take on the cloud photo. Although converting to a negative gives the image a unique artistic interpretation it does make it more difficult to interpret the physics in my opinion. I agree that the red spot is probably due to color inversion on a lens flare that was likely bluish in the original photo. Very unique image, definitely puts a twist on the cloud assignment. 1. Artistically pushing the envelope on creative expression-cool, very eastern European feeling. 2. The flow is well demonstrated. 3. The photographic technique is cool. I like the use of negative in this image. That approach makes this image especially unique as well as a little confusing at first glance. The image is beautiful. Kind of looks surreal. The flow can be clearly seen with unique colors. Definitely a change of approach in these cloud images. I love how the sun and clouds are negative, however I think the white buildings and that red dot in the middle is very distracting to me. Overall fantastic image, and unique style. Art: I really like the contrast with this being a photo negative is fantastic. Photographic technique: The inverting of the clouds adds to the focus on the clouds. I almost thought it was a photo in winter at first looking at the white tree on the right. The surreal effect is very interesting and different. Interesting photo! I like the sun being darkened out in the negative. I find the tree being a bit distracting however on the right side of the image. very cool concept! I don’t know how I feel about the white buildings and tree, but I guess you couldn’t really crop them out. The clouds look very in focus and the inverting effect shows the clouds very well. The red dot on the photo might be better edited out. Cool photo, interesting usage of photo-negative. I would like to see the original in contrast. I feel like the negative and the photo contrast make it a little hard to see some of the detail in the clouds, however the photo is pretty cool nonetheless! Amazing color constract with white cloud and dark sun. Great processing by photoshop! This photo looks like fog floating above ice to me at first glance and the leaves look like some crystal formations on the surface. Interesting perspective to flip the photo to negative to provide more contrast in the image. A higher resolution image for the website would do this high quality image more justice. 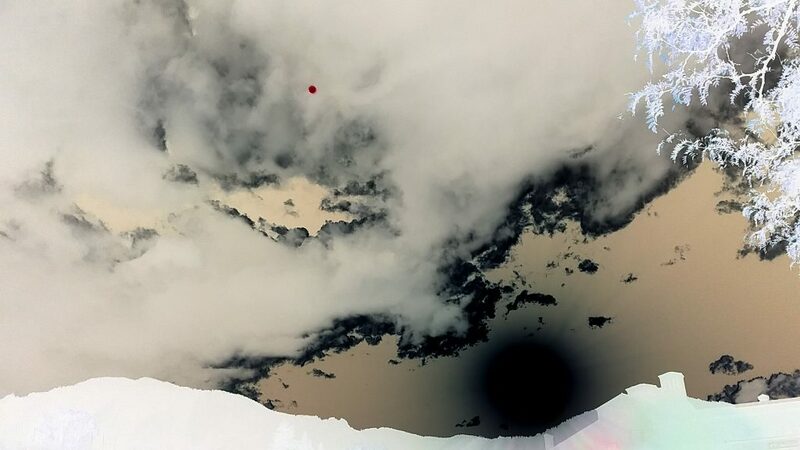 The silhouette of the black shrouded sun and the white mountains is a very interesting perspective the image. Some of the distracting elements (trees and chimney) could be cropped or blended out of the image. This is really cool! I love the black shadows and the yellow in the sky. I feel like the mountains and the building (?) is a little distracting on the bottom. The white tree looks really cool! Very unique photo. Great detail on the center clouds. I can’t decide if I like the negative effect. It grows on me the more I look at the image. Would be interesting to see the original image. Very powerful image! The negative filter gives it a really interesting look that I haven’t seen before, very creative! Very unique photo. The negative makes the viewer have to really think and take in the image to truly appreciate it! Super unique, in fact, it took me almost a minute to figure out what we were looking at. It almost looks like a satellite photo of clouds over the ocean. The red dot is throwing me off quite a bit though, I bet you could have removed that in post. Very striking image, I like the effect from the photonegative. It sun looks a little bit like a pupil. Although there is a red dot in the sky that distracts away from the image a little, possibly try and edit it out in post processing. – This is a really interesting photo! – I like the contrast between the black sun and the white clouds. – Photo appears to be very clear and focused. It is a little busy, and is somewhat hard to tell the difference between the clouds/trees/buildings/mountains unless you look close enough.